Although cyber risk premiums have expanded sizeably in years and loss ratios compare favourably relative to other product lines, sustainable growth of the cyber insurance market should not be taken for granted. 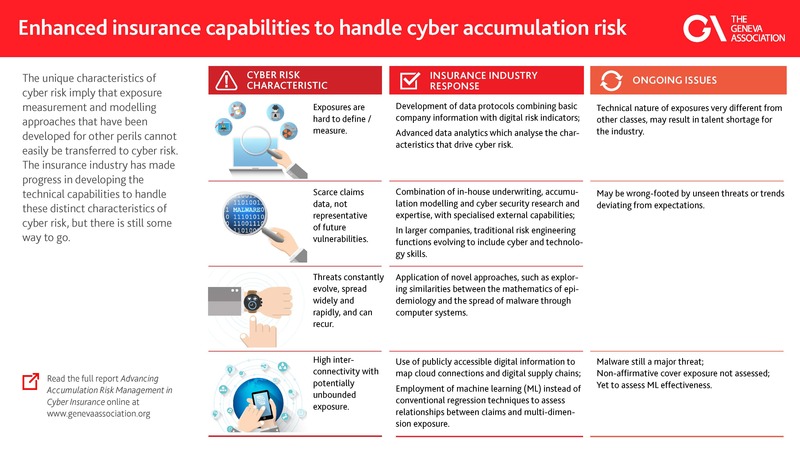 In our new report we identify three fundamental prerequisites to make cyber risk insurable. Despite recent advances, cyber risk creates unprecedented challenges; most notably accumulation risk, which is at the heart of many concerns about cyber risk. For the industry to deal with the accumu­lation threat, it must develop its capabilities in measuring and modelling this risk, and there must be sufficient capital available to sustain a shock. Although the industry has made progress so far, there is more to be done to address ongoing challenges. This report identifies essential challenges of cyber accumulation risk, and looks at how the insurance industry is responding to an environment where a high degree of interconnectivity could lead to potentially unbounded impacts from threats that are constantly changing, can spread widely and rapidly, and recur. This research brief summarises the key finding of our latest report on cyber accumulation risk.